my fav food: pizza. given a choice i choose pizza every time. mea culpa. i add spinach, olives onions. in desperation to make it healthy i add the ubiguitous broccoli. eech. what a stench. what a nasty taste. in the words of George H. W. Bush "I do not like broccoli. And I haven't liked it since I was a little kid and my mother made me eat it. And I'm President of the United States and I'm not going to eat any more broccoli." lol. but personally i'll eat a lot of fish. perch is good. haddock better. spinach i will drown in. love spinach. hey popeye! i'm with you. good for her. if she gets the shakes too bad. looks like a case of "LOOK AT ME" a real medical condition? yeah. a MENTAL contdition, most definately. her so called "Selective Eating Disorder" dear ms. british woman. have a stroke have a heart attack but please don't try to garner sympathy for your diet choices. 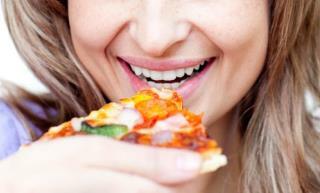 It all depends what you put on your pizza... but it can be healthy. I bet this woman doesn't go for the "everything" pizza ... the article says she only eats "plain" pizza, whatever that is.. probably some frozen dough disc topped with tomato puree and insidpid cheese. But, a nice whole grain crust topped with lean meat, assorted vegs, low fat cheese... comes close to a well rounded meal.